(Phys.org) -- How can blue whales, the largest animals on the planet, survive by feeding on krill, shrimp-like creatures that are the size of a penny? According to UCLA life scientists, it's all a matter of dimensions. In findings published May 30 in the journal Nature, the researchers demonstrate for the first time that the relationship between animals' body size and their feeding rate  the overall amount of food they consume per unit of time  is largely determined by the properties of the space in which they search for their food. An animal searching for food in a three-dimensional space, like the ocean or sky, is likely to consume much more than a similarly sized animal searching in a flat, two-dimensional space, like a savannah or a sea bed, they found. "Surprisingly, the spatial dimension of the search space turns out to be the most important property," said Van Savage, senior author of the research and a UCLA assistant professor of ecology and evolutionary biology and of biomathematics. "Yet up until now, work on food webs and predatorprey relationships has almost universally assumed that feeding rate increases with body size in a way that is independent of dimensionality." Animals, of course, cannot simply go to the market when they are hungry. Instead, they must search for their food, which can also move in space. Cheetahs, for instance, scan the savannah for gazelle in two dimensions (left-to-right, forward-to-backward), while sharks search the ocean and some birds, such as flycatchers, scour the skies in 3-D (with an added up-and-down dimension). "Would you rather search for food in two dimensions or three?" Savage asks. "That is, would you rather search for food just left-to-right and forward-to-backward on the floor of a room, or would you also want to search up-and-down, from floor to ceiling? When I quiz people, including scientists, most say they would rather search in two dimensions because it would be easier to find food. But we found that in nature the third dimension usually adds a huge number of extra resources. Ultimately, searching in this extra dimension provides many more chances to find food." The UCLA researchers developed a new mathematical model that predicted that feeding rates increase more quickly with body size in three dimensions than in two. The model helps explain why huge whales can subsist on tiny krill in three dimensions  but likely could not in two dimensions, if they had evolved to live on land. To test their ideas and model predictions, the researchers compiled and analyzed the largest-ever database on relationships between feeding rates and body size. They were surprised to discover how well the data fit their predictions. "I was amazed that the data and theoretical predictions match so well," said Samraat Pawar, lead author of the study and a UCLA postdoctoral scholar in Savage's group. "After spending so many months working on the theory and wondering if it really connected to reality and then spending so many more months finding and analyzing real data for feeding relationships, I knew it was very meaningful when they matched. "When looking across species, an increase in consumer size leads to a much faster increase in feeding rate in three dimensions than in two dimensions. Moreover, for two consumers of the same body size, the one in three dimensions will typically have a much higher feeding rate than the one in two dimensions. Our results reminded me of Edwin Abbott's book 'Flatland,' in which denizens of a two-dimensional world are trapped in an ostensibly inferior existence due to their inability to perceive the third spatial dimension." This is one of the first demonstrations, Pawar added, that uses both theory and data to show that dimensionality has important implications for ecology. The ultimate goal of the research, the scientists say, is predicting how climate change will affect biodiversity levels and, thus for humans, the availability of goods and services, such as food and plants, fungi or bacteria used to make pharmaceuticals. The new findings suggest there may be crucial differences in how climate change will affect ecosystems that are more two dimensional, such as land and water surfaces, and those that are three dimensional, such as the open ocean or air. 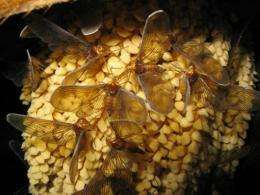 The study also predicts that the stronger feeding interactions in three dimensions  that is, the tendency for animals to consume more than they would in two dimensions  will lead more often to boom-and-bust cycles in the abundance of species, analogous to large fluctuations seen in stocks or housing prices. These booms and busts make species more prone to extinction and therefore "could have profound consequences for understanding and preserving biodiversity in different habitats and for the planet as a whole," Savage said. What made the UCLA study "unique and allowed for the discovery of new patterns was the researchers' focus on pairs of species  just one 'consumer' species feeding on just one 'resource' species  for both the modeling and data," said study co-author Anthony Dell, a UCLA researcher in Savage's group. "Previous studies looked at many species together and at properties of whole ecological systems or whole food webs that describe all potential feeding relationships," Dell said. "All of the existing food-web models assume that dimensionality does not affect how feeding rates increase with body size. However, we found there is both a strong and systematic interdependence that should be straightforward to incorporate into models and data analysis. Our findings mean that a lot of the previous work may need to be revised." Savage's research group also has a unique approach that utilizes perspectives from physics and applied mathematics to study biological problems. "Having been trained in theoretical particle physics, I automatically consider dimensionality as part of any problem, but I was impressed by how large the effect is here," Savage said. "Dimensionality has long been considered important in physics, where people think about string theory and extra dimensions of space." The scientists are currently looking at the effects of temperature  another major driver of feeding rates  and studying how to combine that with the results of the current study on feeding rates and dimensionality.